As many manufacturers of nonstick cookware move away from Teflon-based formulas, ceramic coatings have become more popular. As seen on TV, the Gotham Steel pan features a nonstick titanium plus ceramic coating. Not only does it provide a durable nonstick base, they say that you can use your regular metal utensils with Gotham Steel. But is that really the case? Or is Gotham Steel a scam? 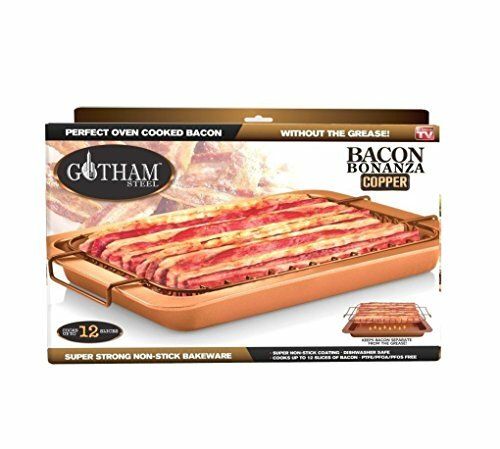 In this Gotham Steel review and buyer’s guide, you will discover a whole line of nonstick cookware products, pros and cons to consider, and sound advice to help you make an informed buying decision. Gotham Steel Cookware, endorsed by Chef Daniel Green, is made from an aluminum base and coated with a ceramic and titanium non-stick coating (Ti-Cerama). These pots and pans are extremely heat tolerant in comparison to other ceramic cookware and are claimed to tolerate up to 500 degrees Fahrenheit / 260 degrees Celsius. However, most of their nonstick pans, particularly those with lids, will not tolerate more than 375 degrees Celsius / 190 degrees Fahrenheit. 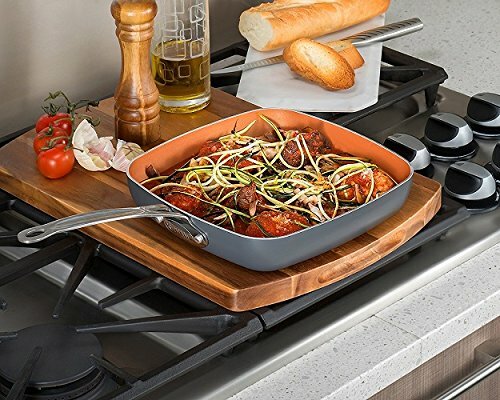 So, if you like to finish a dish in the oven or under the broiler, these attractive pans may be what you’re looking for. Are you a fan of soup? A hot pot of soup can be kept warm in an oven with less risk of scorching. Simply cover the soup and place it in your oven at 325 to 350 degrees Fahrenheit / 163 to 177 degrees Celsius. If you’re looking to cook with extremely low fat, their Gotham Steel cookware set touts that oil and butter aren’t needed. Keep reading to find out if this is the case or not. 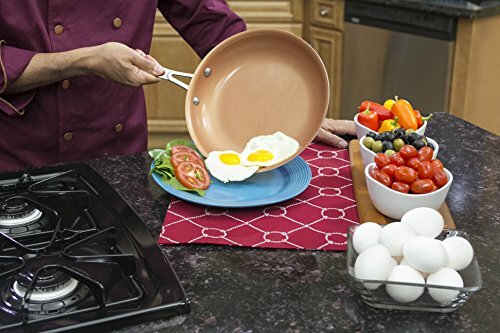 The ceramic-titanium non-stick coating is quite durable and will give you plenty of flexibility. But the coating can be scratched by metal utensils despite what they say. So, you should use your silicone or nylon cooking utensils for these pots and pans. Finally, it's important to remember that these pans are made of anodized aluminum. They're quite durable but extremely lightweight. You will need to let them cool after using and before you clean up. If you don’t, the aluminum can flex when exposed to temperature extremes and may cause the non-stick coating to lift up, tear or break away from the aluminum shell of the pot. Is Gotham Steel Pan Safe? This cookware has remarkable heat tolerance and should not outgas when heated within Gotham Steels recommendations. It is PFOA, PTFE, and PFOS-Free! Is Teflon safe? While older Teflon can release the toxin PFOA when overheated, ceramic nonstick coatings do not outgas. For households with pet birds, this is especially critical but can also impact children and small pets. Per the American Cancer Society, exposure to high levels of PFOA has been linked to an increased risk of testicular cancer, kidney, thyroid, prostate, bladder, and ovarian cancer, though research is limited and on-going. There are many reviews online, both good and bad, about Gotham Steel cookware. I think it’s important to break down and address each so that you can get a better idea of what’s actually going on. The #1 complaint is that these pans start to stick quickly. We’ve already covered some of the good points in the section above, “What is Gotham Steel?” So let’s continue and get that out of the way before diving into the darker side of things. Let’s look at the following two video reviews for positive examples before we look at a bad case. In our first example, the gentleman cooks a salmon dish with sticky stuff including honey and soy sauce, without using butter or oil. He heats the Gotham frying pan on the stove and tests it with a laser temperature gun which registers around 390 - 400F. When the dish is finished cooking, the bottom of the inside of pan looks a little burnt. He uses a dry paper towel to clean it but doesn’t get too far. He tries using his spatula and scrapes it a little better. Finally, he uses a damp paper towel on the pan, and it cleans up much easier. The key takeaway here is that he didn’t use soap, a brush or sponge to clean the pan. It’s just like the as seen on TV infomercial. In our second example, Sherry is cleaning burnt food from her Gotham Steel square pan. She claims to have been using this pan every day for the past 6 months. In the video, you’ll see that she uses a sponge while scrubbing the pot under running water. When these types of sponges are new, the rough side can be very abrasive, and I wouldn’t recommend using that with nonstick cookware in general. Luckily, her sponge looks old and is probably quite soft. However, she mentions in the comments that she uses a “non-scratch sponge.” She also used soap, and the pot cleans up very nicely. She talks about the coating of the pan having an oily base and not being greasy feeling. She attributes that to her first use by frying oil and dough in it. So far we have some great examples of what this cookware can do, but let’s take a look at the uglier side of things. Is Gotham Steel Induction Ready? Most of these pots and pans are built on aluminum shells, not steel, so they are not induction capable. However, some newer lines are induction ready, so you’ll have to ensure that they are before purchasing. The use of the word "steel" in the product name may cause some confusion. For example, steel and iron pans will work well on an induction cooktop, but you may find that these pans will not work with your induction cooktop. If you have an induction cooktop and want to try these pans without worry, consider purchasing an induction heat diffuser to use with this cookware just in case. Steve on the hand has had a terrible experience with Gotham Steel. Food sticks in his pans, chips are forming around the edges, and they are warped. It’s very clear that the remnants of cooking bacon are stuck to the bottom of the pan unlike in our other examples. Unfortunately, he is well past his warranty period at the time of making the video. He claims that his pans were already warped upon purchasing, but he would have had to pay for shipping costs to send them back. Because of those extra costs, he refused to ship them back and was left with these pans. While he presents a great case for avoiding this cookware, we have a few thoughts that may have improved his experience. 1. It sounds like he purchased his pans through the official website, but also claims that he could have bought them locally cheaper. We’re not sure why he chose to do so. We are a fan of large online retail stores who may have better return policies. Some local shops may also have great return policies, so take advantage of them if you need to. 2. It may seem like common sense to some, but getting a warped pan should have been a signal that things aren’t going to work out. A warped pan cannot heat properly and lead to hot spots and further warping. 3. It also sounds like he pushed the temperature of these pans. 500F in the oven is much different than the stovetop. A stovetop burner is concentrated heat from the bottom and many, especially from a gas range, can rise beyond that temperature very quickly. Remember when I mentioned about temperature extremes? We think the combination of excessive heat and the initial defect of the pans were the cause of his issues. While many rave about how easy Gotham Steel cookware is to clean, others struggle with everything sticking when they cook. Because the bonding process of getting the ceramic and Teflon to stick to the aluminum pan can be challenging, perhaps Gotham Steel is struggling with QC issues or is it all on the end user? A quick note on heat: While many people feel that their “medium” heat is not that hot, ceramic cookware is not like other nonstick cookware. It needs less heat and fewer temperature swings, no matter the brand. That being said, this cookware seems to be quite durable. Like any pots and pans that are constructed of multiple layers or built with special coatings, there is the risk of failure, breach or damage. Don't expose them to tremendous temperature shocks that may put the nonstick coating at risk. Per the manufacturer, some pots and pans are dishwasher safe. However, things can get bumped around in the dishwasher. Since these pans are promoted as being easy to clean, perhaps the best choice is to let them cool, and hand wash them. If you've ever struggled to transfer a full pan from stovetop to oven or back the other direction, you know that a heavy pan such as a cast iron skillet can make the task uncomfortable and dangerous. Because Gotham Steel cookware is built with an aluminum core, the pieces are much lighter than steel or copper and transfers heat extremely well. That can be a real bonus when you're trying to whip up a quick breakfast, but you’ll need to be careful because the steel handles will get quite warm as you heat the body of the pan or skillet. While many fans of ceramic nonstick bought cookware with rubberized plastic in the handles and lids, that material won't tolerate more than 350 degrees Fahrenheit / 177 degrees Celsius. Gotham Steel frying pans are much more versatile in that respect although lids will need to be treated with extra care in the oven. Unfortunately, if you have an induction cooktop, many of these pans will not work in your kitchen without a heat diffuser. As stated before, aluminum does a great job of transferring heat, though it will lose heat as you add cold food to the pan before it comes back up to temperature. It’s important that you don’t move your food during this time because it will stick. Once the proteins in your food have cooked, they should be released from the pan. If you’re new to Gotham Steel, we think the ideal place to start is with a frying pan versus buying a complete set. If the pan doesn’t turn out the way you had hoped, at least you don’t have a whole cupboard full pots and pans to deal with. Is Gotham Steel Pan Safe To Use With No Oil? Yes, per the manufacturer, you can cook oil free in their pans completely. However, do not use cooking spray because it creates a residue and will damage your cookware pan over time! You can cook without extra fat. For many of us, this can be a challenge. Not only are our taste buds ready for a bit of fat, but our ears are too. As you move into low-fat and non-fat cooking, be aware that you won't hear any popping of oil as you cook, so you'll need to keep an eye on things! How To Season Gotham Steel Pan? No seasoning necessary! Wash the pan according to the instructions, avoid banging or stacking that will put the finish at risk, and have fun! Again, if you've gotten accustomed to applying a layer of cooking spray, move that spray to the opposite end of the kitchen when you use your Gotham pan. While many cooks like a bit of olive oil in their pans, cooking spray is strongly frowned upon by the manufacturer. The Gotham Steel 15 piece cookware set is loaded with pretty much all the pans a home cook needs to prepare everything from appetizer to dessert! This set includes two saucepans, each with lid, multiple frying pans, a lidded stock pot and the coveted deep square pan. Also, you'll enjoy access to a fry basket insert for the deep square pan and the steamer insert for the stock pot. Each lid is made of tempered glass and rimmed in stainless steel. The lid handles are quite wide and offer plenty of space between glass and steel, so no blistered knuckles when removing a lid to stir the contents. The handles of the pans are also riveted stainless and are flared for plenty of space for your fingers. Long handles all feature a hole so you can hang these pots, both for display and to protect the non-stick coating from damage caused by stacking. The larger pans offer a helper handle across from the long handle to help balance large portions. Also, many of the larger pots have a spout to make it easy to pour from the pan into a serving dish with little risk of spilling and scorching the outside of the pan. It should be noted that these aluminum pans are quite lightweight and you may notice them move across a flat glass top when boiling or frying vigorously. The lids might make the pans somewhat top-heavy. It's never a good idea to leave a hot pan unattended, but some of these pans can make that decision especially hazardous. 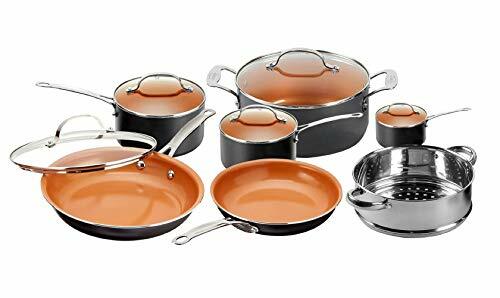 If you're looking for a complete set, consider the Gotham Steel Ultimate 15 piece cookware set. If you're not quite there yet, read on. The Gotham Deep Square Pan is nearly 6 inches deep and can be used for many different styles of cooking. You can saute, fry, deep fry or steam in this pan. Thanks to the generous volume of this pan, you could even make a small serving of French onion soup and easily transfer it to the oven for a delicious finish. 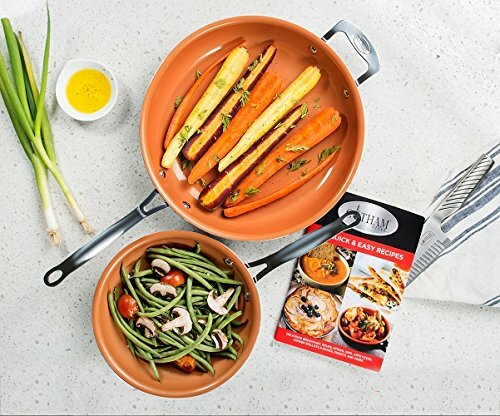 Per the advertising, this pan is ready to use on an induction cooktop, but many users with induction cooktops have been disappointed with this product. Again, owners of induction cooktops will want to start small and be ready to return the product. This versatile pan comes with a steamer tray that clips into the pan and is an ideal spot for fresh vegetables. Your square pan will also come with a mesh frying basket for easy deep frying. 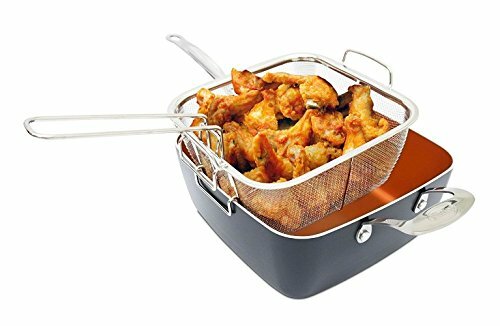 This basket clips safely onto the pan and has an extra-long handle for safe and easy transferring of your freshly fried foods. Finally, this pan comes with a steel-rimmed tempered glass lid. The flared handle on the top of the lid is quite tall and should give you plenty of space for your fingers. 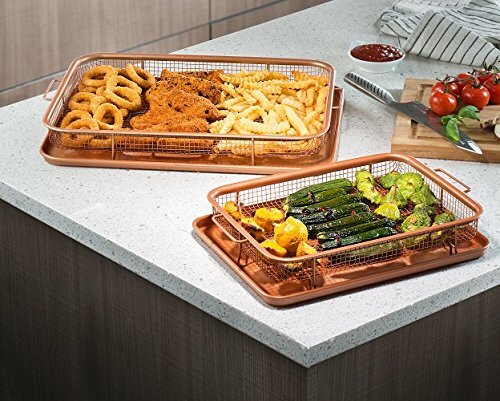 If you like fried foods but don't want to fiddle with the spatter and mess of deep frying, the Gotham Steel crisper tray may be a great option. 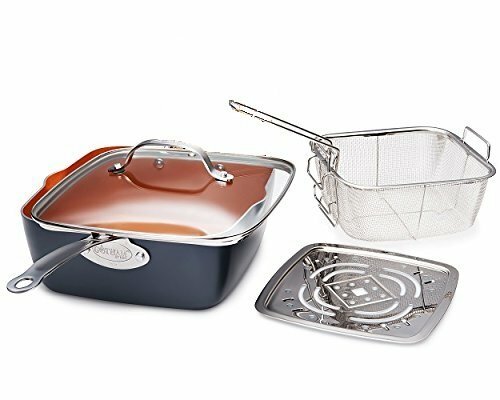 This set includes a mesh tray and drip pan, both sealed with Gotham Steel nonstick coating. 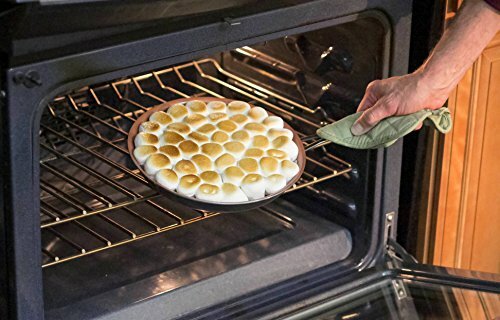 This pan can save you a lot of mess in your oven. You can slice French fries or potato wedges, coat them in olive oil, add seasonings and bake over the drip tray for flavorful, crispy homemade fries with no mess to drip all over the hot oven surfaces. This tray would also be a great spot to slow-cook bacon or other high-fat meats, so they crisp up without a lot of dangerous and messy spatter. You can split up the set and load vegetables for grilling on the mesh pan. Simply place the grid portion of the pan inside the grill and let your vegetables roast away. If you've ever chased asparagus around on a grill, this grid should come in handy! Finally, this pan combination can take the heat. Like all Gotham Steel, the crisper tray will tolerate up to 500 degrees Fahrenheit / 260 degrees Celsius. 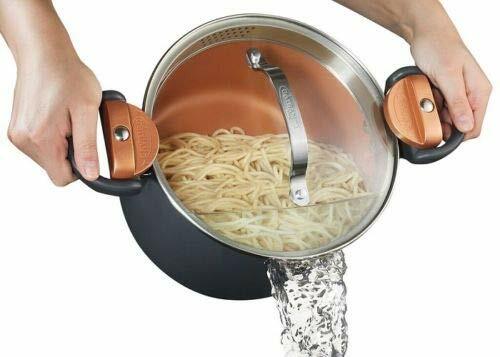 The Gotham Steel pasta pot is built to pour safely and easily, so no struggles to strain your noodles anymore! 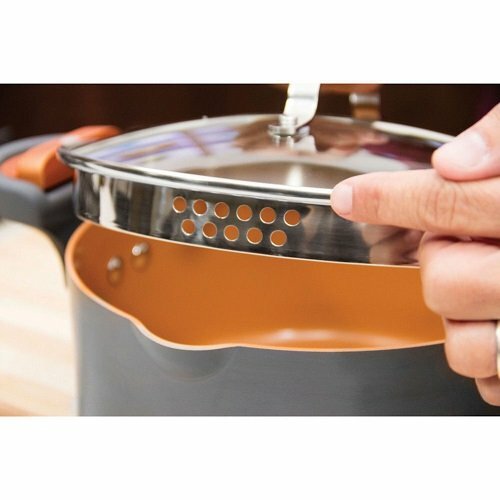 The locking lid has both small and large drain holes, so no matter what you need to strain, you can adjust the lid to keep your food in the pot while dumping out excess liquid. The Gotham Steel pasta pot will work for more than just pasta, of course. 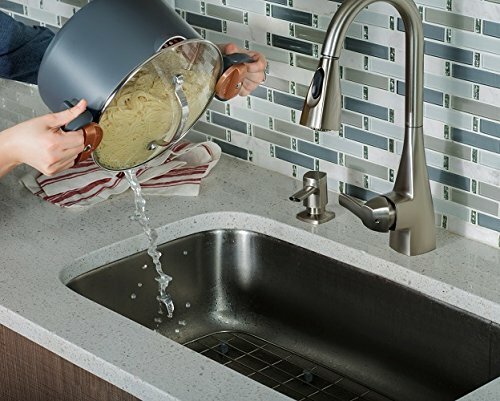 You can easily fix soups, sauces or mashed potatoes in this pot, and the locking handles make it easy to move to the sink to drain or to the table to serve. The straining mechanism is built right into the tempered glass lid. Simply rotate the lid to line up the drain holes, lock the handles and tip the pot so liquid escapes through the pour spout. The locking handles on the pot are critical in the straining process. To release the lid, twist the handles out. To lock it, twist the handles in. Once the handles are locked, promotional materials suggest you can carry the Gotham pasta pot by the lid. If you choose to try this, do so with care! The Gotham nonstick 10.5-inch grill pan is a great tool for preparing meat both on the stove and in the oven. It should be noted that this pan is quite shallow. If you're preparing bacon, you'll want to keep a close eye on this pan, so you don't have an oily disaster or fire in the oven or on the cooktop. The square grill pan is designed to give your food authentic grill marks, even if you prepare it indoors. Unfortunately, this pan will not work on an induction cooktop. The grill pan features a steel handle with plenty of reach so that you can keep your fingers away from the heat. It's coated in the traditional Gotham Steel titanium and ceramic combination, so it should be very easy to clean up as long as you take care of it properly. See our best Titanium cookware guide for a another comparison. As with other aluminum cookware, this pan is very easy to handle at a weight of fewer than 1.5 pounds. Take care to let this pan cool before washing it to protect the coating. You can enjoy plenty of cooking space on this reversible stovetop grill! One side is smooth and would work great for a hearty breakfast of pancakes, eggs, and bacon. Let it cool, wash it up and flip it over to make burgers for supper! The Gotham Steel double grill features multiple grooves to catch grease. The ridged side of the grill will keep your burgers, hot dogs, fish, chicken or steaks out of the drippings for authentic flavor with no grease. The flat side of the grill has a deep grease trough all the way around the cooking surface. The unit is nearly 2 feet long by 1 foot wide so you'll need to place this grill over 2 of your burners and turn the burners up to a similar heat. 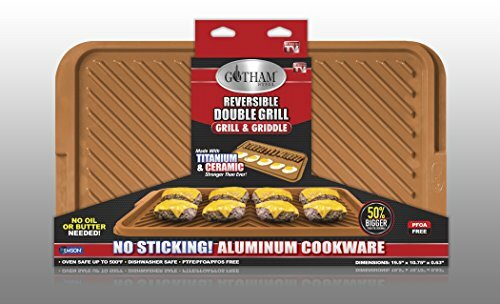 The Gotham Steel grill can also be used on an outdoor grill. Again, if you've ever chased asparagus or hot dogs around on an outdoor grill, you'll appreciate how easy it is to load up and use. If you love the taste of bacon but can't abide the grease, the Bacon Bonanza can help keep them separate. It's also a great way to cook bacon and keep it from curling up. You simply line up the bacon inside the easy to use grid, bake it and serve. The bottom tray will catch the bacon grease, and you'll enjoy crisp, straight bacon! Be prepared to experiment a bit. Many users have struggled to use this pan as recommended. Many find that the grooves that hold the bacon are too close together and result in bacon that's burnt on the top and soggy or uncooked at the bottom. If you have a convection oven, use as recommended and it may be fine. If not, try stretching out the bacon in every other slot for a better result. Fans of low-fat cooking may be a bit disappointed with some of the recipes featured in the Gotham Steel Cookbook. For cookware that offers you the chance to cook with little to no oil, these recipes are often quite high in fat and calories. There's also some confusion as to the connection between this cookbook and Chef Daniel Greene. Fans of Greene have struggled to find his recipes in this cookbook. That being said, this cookbook is quite handy and, as a free addition to the cookware set is quite popular among Gotham Steel Cookware users. As a free-standing purchase, you may be disappointed. Again, if your goal is to cook with as little fat as possible, you might be better served to experiment with existing favorites while you try out new recipes. While there are many unique and (probably) delicious recipes in this Crisper Recipe Cookbook, they seem to be quite high in calories, sugar, and fat. However, this cookbook does offer a wide variety of vegetarian options. Those working on a paleo diet may also enjoy the options available in this cookbook. Again, this cookbook is loaded with new recipes to try with your Crisper Basket. To modify your favorites, be prepared to do some experimenting with oil content and seasonings. 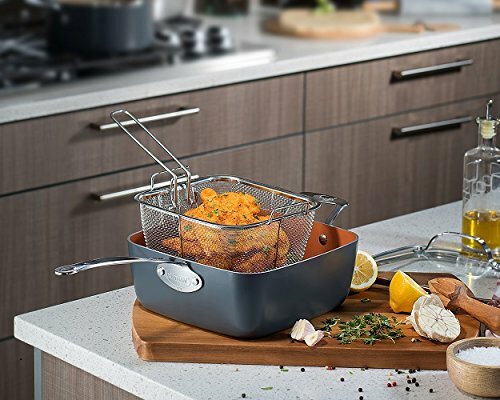 The Ceramic Titanium Cookbook is specifically geared to the numerous dishes you can prepare with your square frying pan, steamer insert and fry basket. Be aware that this is not simply a non-stick or no oil cookbook, but a specific guide to use a square frying pan. That being said, if you have limited storage space or have only started stocking your kitchen and have purchased a Gotham Steel square pan with attachments, this cookbook may serve you well! It offers not only recipes geared to this pan but has plenty of suggestions for modifications of your existing recipes to cook with less or no oil. Like many new product lines, Gotham Steel cookware gained a lot of attention and is extremely popular amongst those hoping to replace their Teflon pans. If you’ve never used Gotham Steel cookware, we think the 12.5” Gotham Steel frying pan is a good to place to start before making a larger cookware investment. If you’re already a fan, the Gotham Steel Ultimate 15 piece cookware set may be the next logical choice. As we’ve covered, it seems that some users will have a great experience while others will be left feeling disappointed or angry. If Gotham Steel can get past manufacturing issues, educate users how to prevent the issues presented in our guide and get great quality pans into the hands of those unhappy customers, this product line will continue to thrive for years to come. 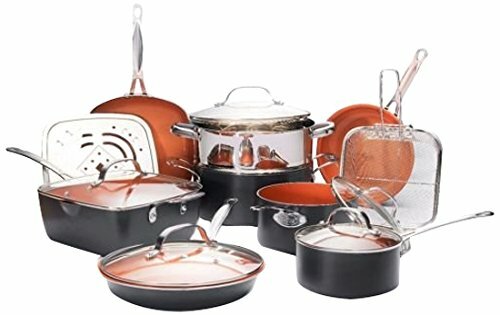 Do own any Gotham Steel cookware products? If so, please share your experiences in the comments below to help other home cooks make an informed buying decision. My fired eggs stick and get brownish. How do I get them to slide out? 1. The coating is damaged. This could be from abrasive washing, heat damage, using cooking sprays, or perhaps a manufacturing issue. 2. Using too high of heat. If you’re using a high heat and trying to remove the eggs before they are ready, they may stick. This is common with all types of cookware. Try using a lower heat and more time. 3. If the eggs are getting brownish (brown that is not from being crispy) I would stop using the pan right away and get in touch with the manufacturer or the place that you purchased the pan. If you don’t suspect the coating is damaged, you may have to use a little butter to cook your eggs.